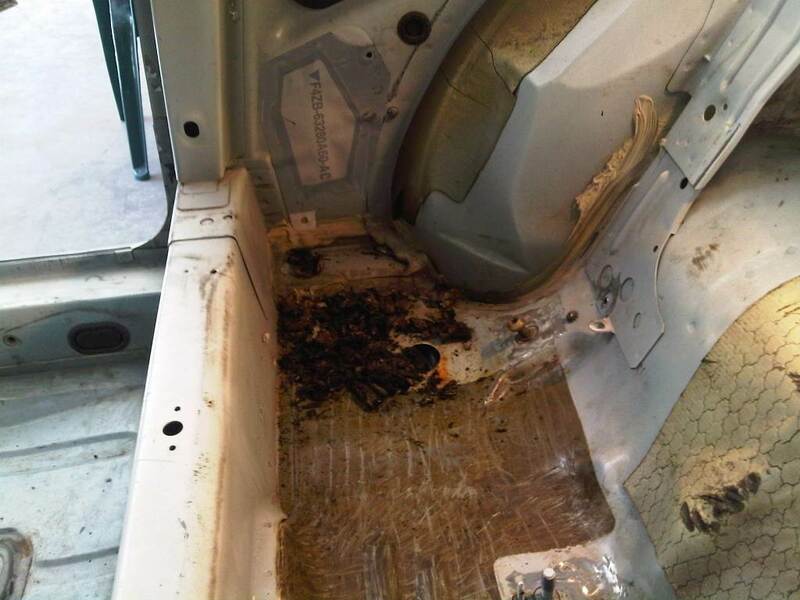 I was scraping off the seam sealer and undercoating around the rocker panel where it meets the floor behind the B-pillar when I found a ton of rust and rot. 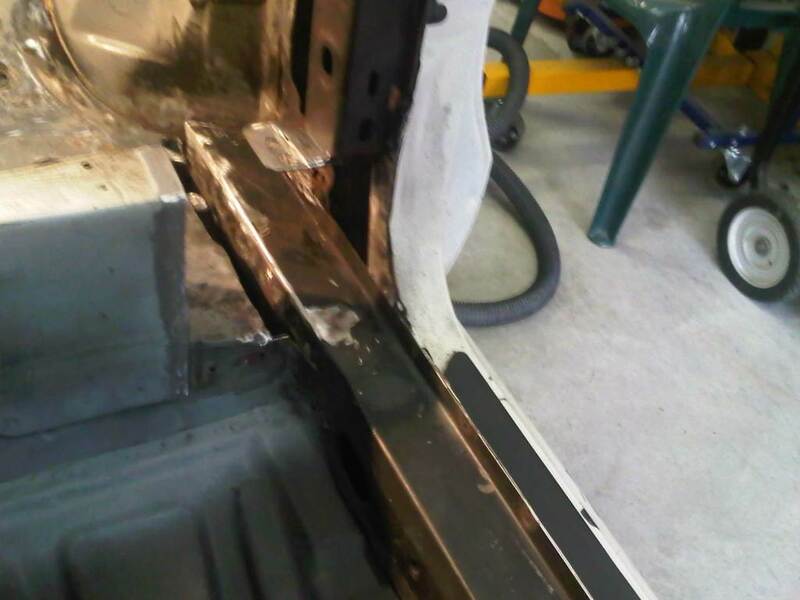 When the car was repaired in 1997 and the new rocker panel and B-pillar were installed, they did a poor job of re-connecting the existing floor to the rocker and coated the entire area with seam sealer and undercoating. 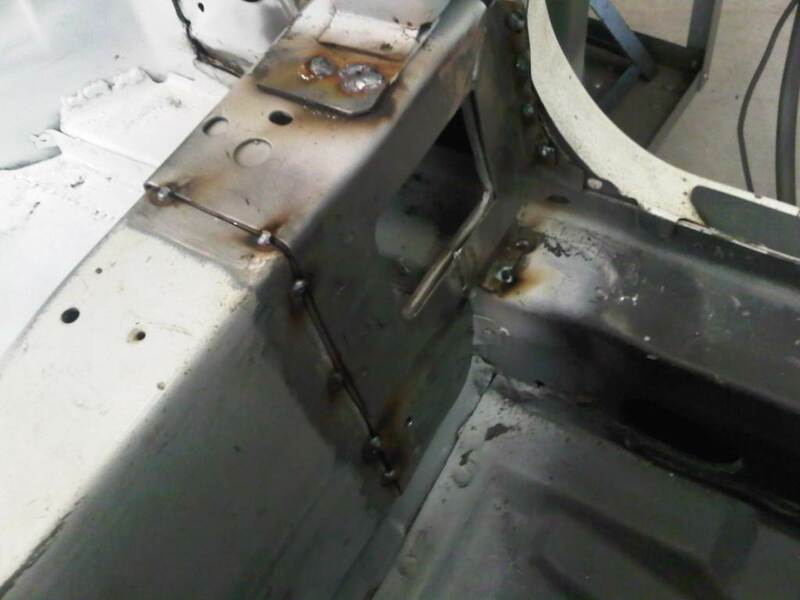 What happened is these conditions created a area for moisture to sit and cause the sheet metal to rust out. 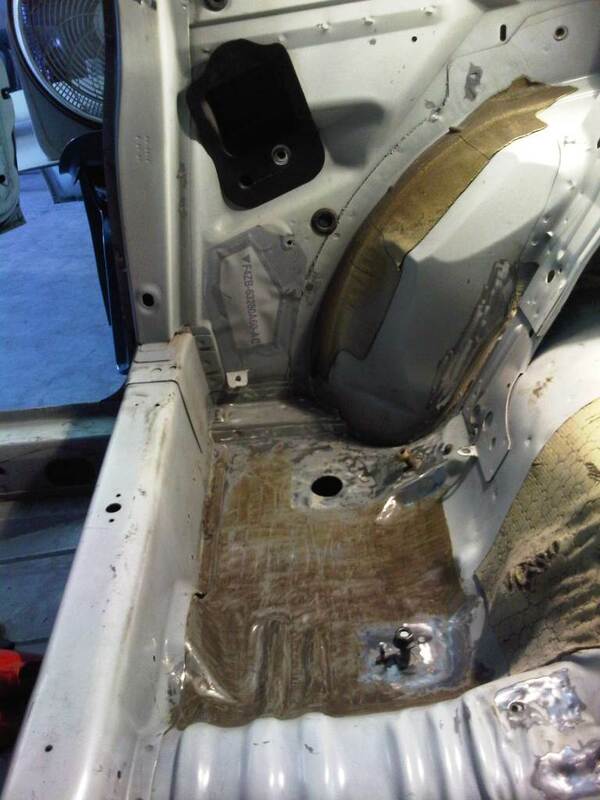 In order to get at all the rust to remove it, I had to cut out part of the rear seat crossmember where it attached to the B-pillar, rocker and floor. 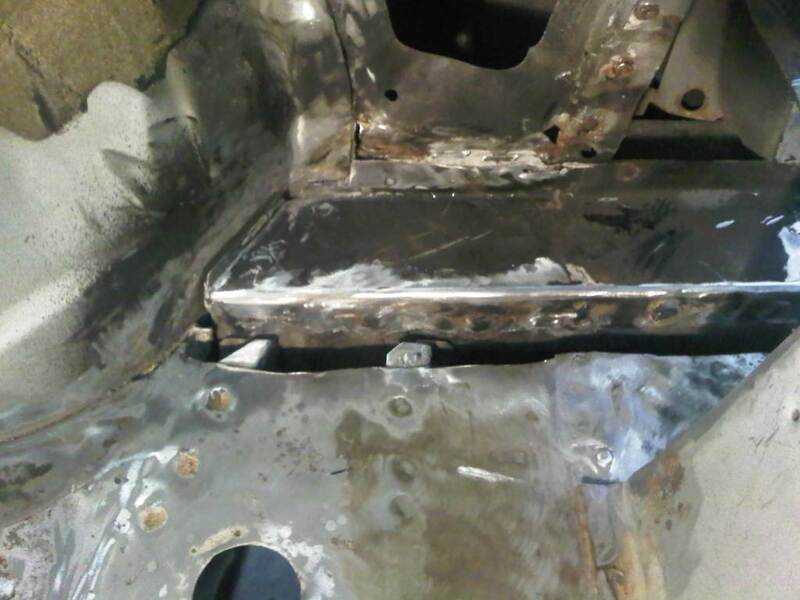 Then I was able to cut out the part of the floor that was rusted-out. 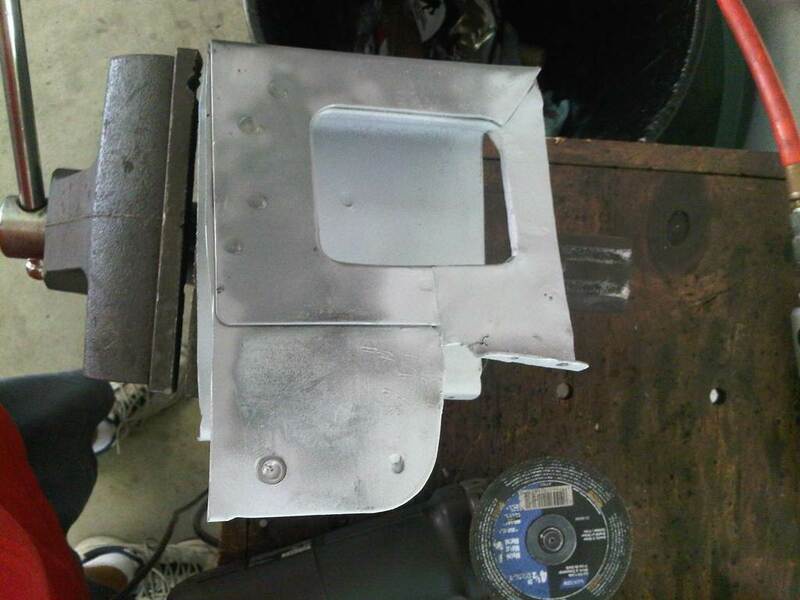 I fabricated up a piece of sheet metal and began welding it in. 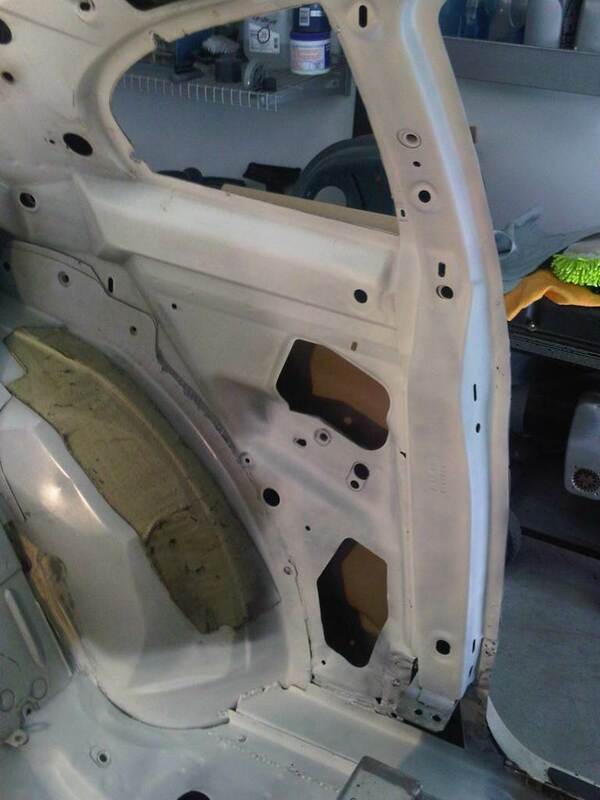 While I was working on the floor, I notice that there were some areas on the B-pillar that needed attention. 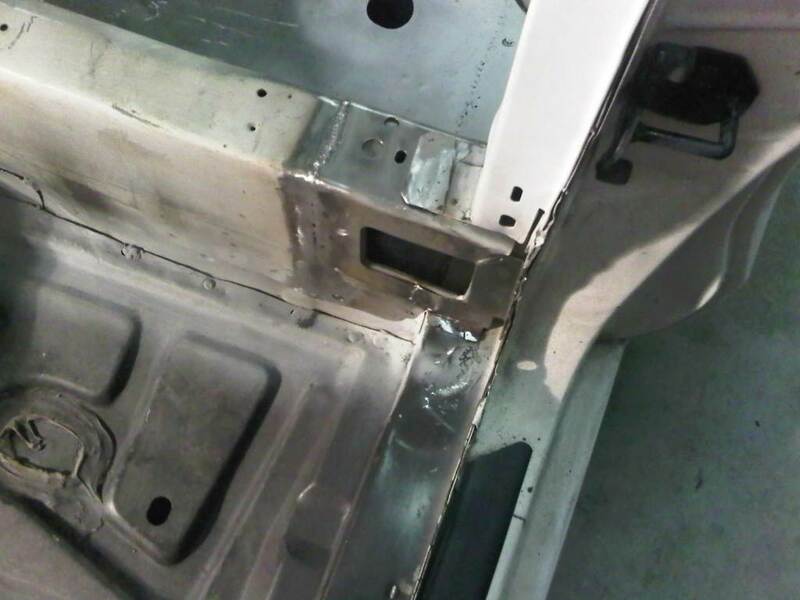 Several welds were done poorly and others were missing entirely. 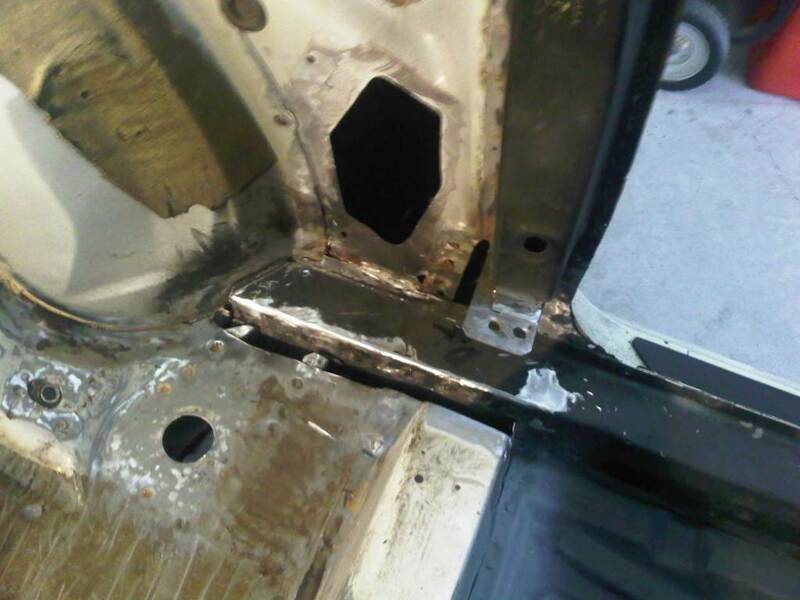 I spent some time re-welding the B-pillar and dressing the welds. 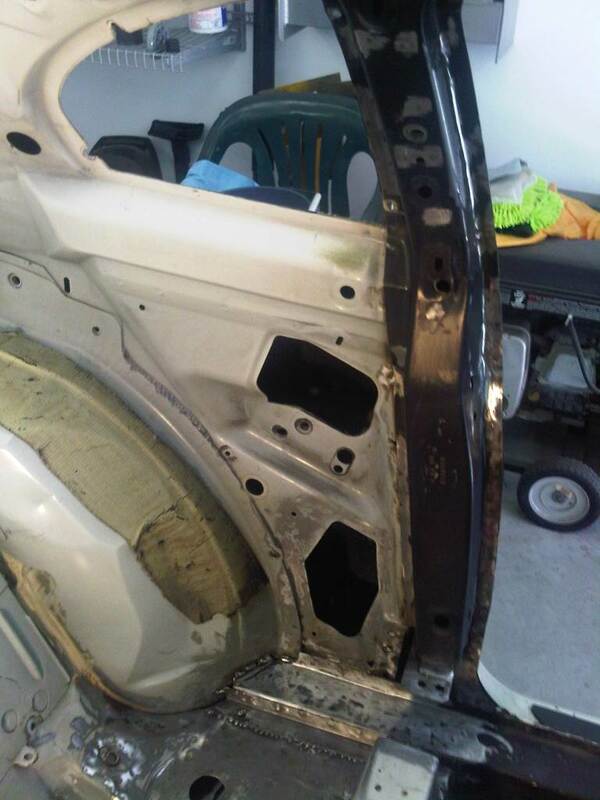 The area directly behind the B-pillar needed attention also. 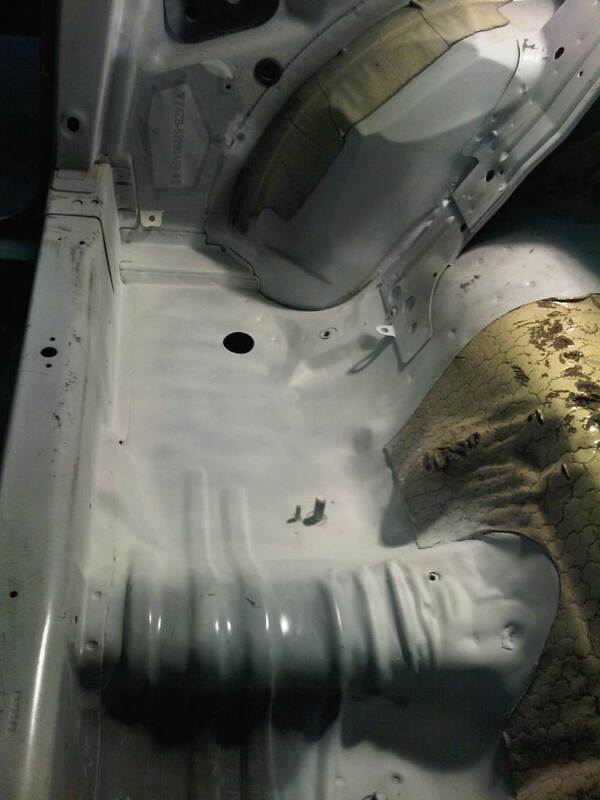 There was undercoating, seam sealer and some body work that needed to be done. 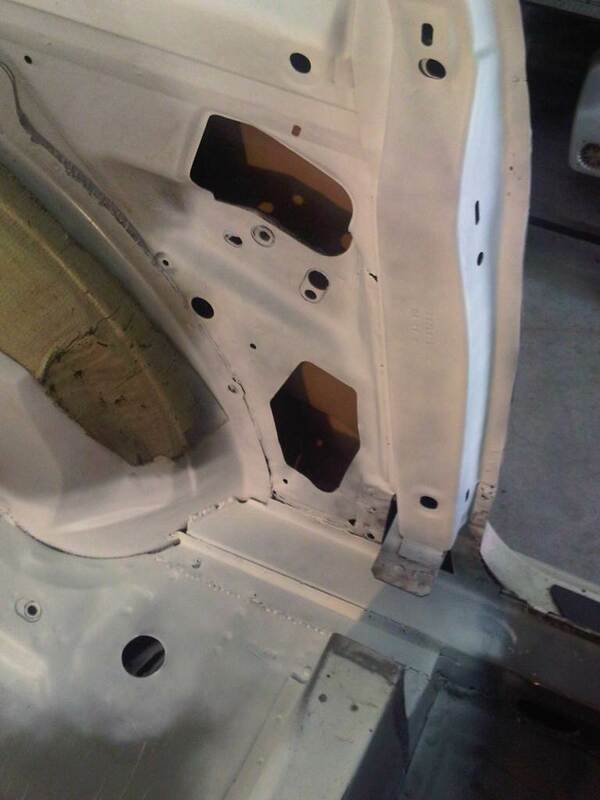 After that, I applied my first coat of primer. 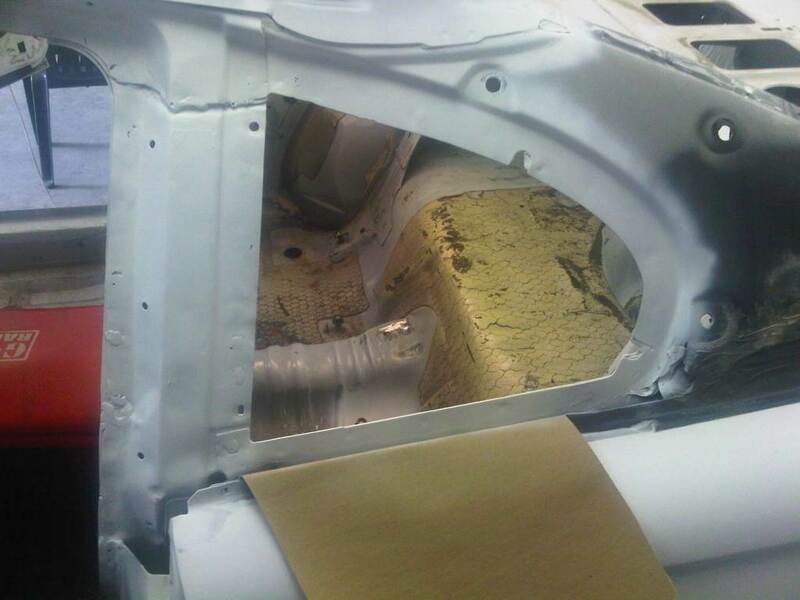 All it did was highlight all the flaws in the areas around the rocker panel and B-pillar. 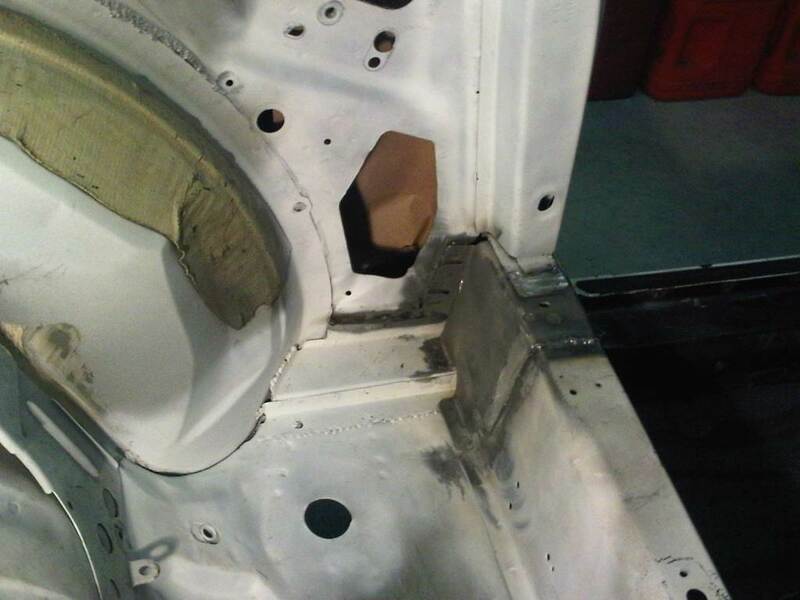 There were still holes in the B-pillar that needed welding and areas in-front and behind the B-pillar needed some attention too. 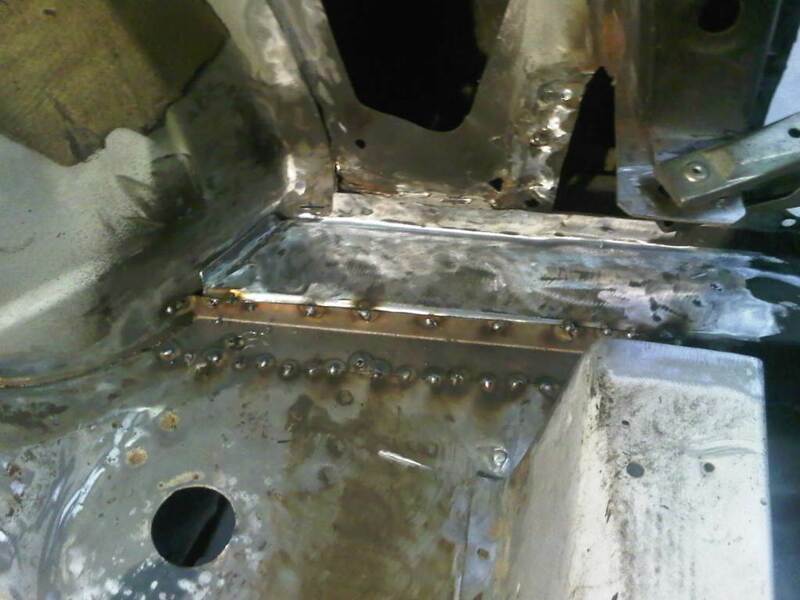 There are some really ugly welds in the forth picture. 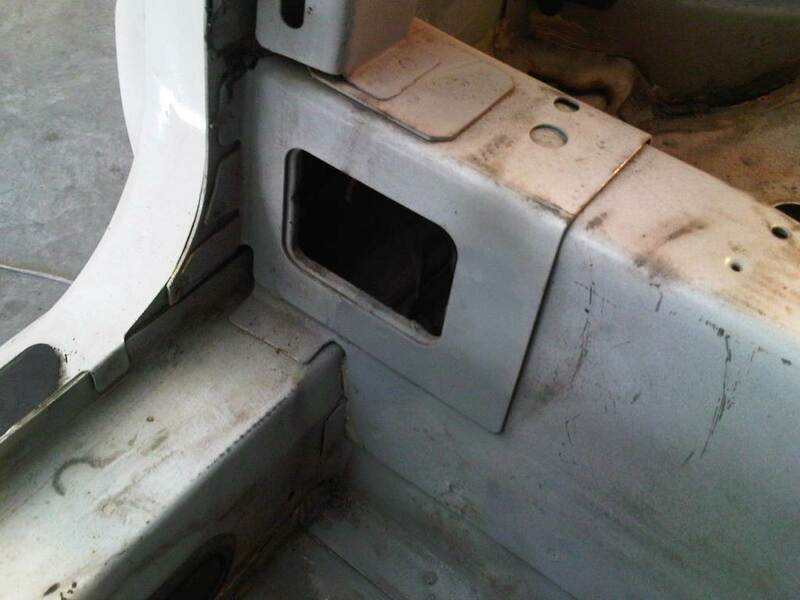 While I was working on the B-pillar, I took some time to clean up and prime the outside of the quarter-window frame. 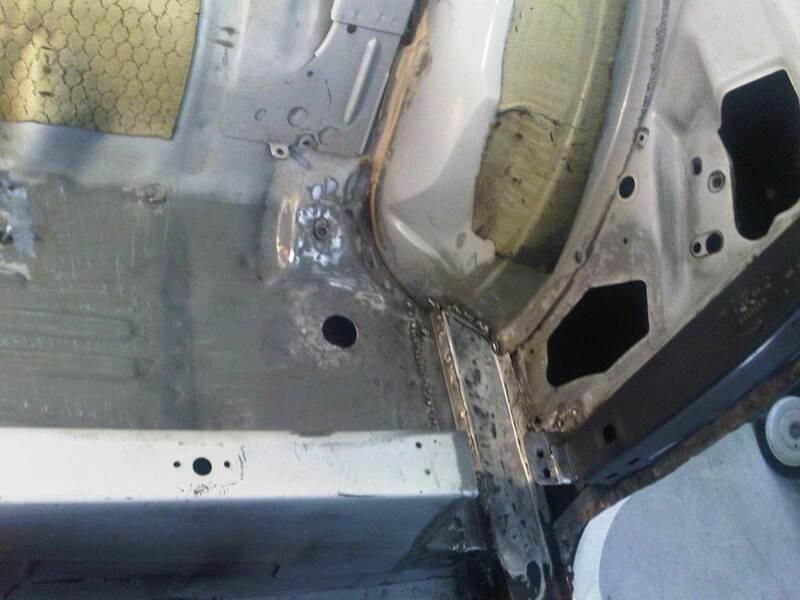 The section of the crossmember that was cut out is in pretty bad shape where it attached to the front of the B-pillar. 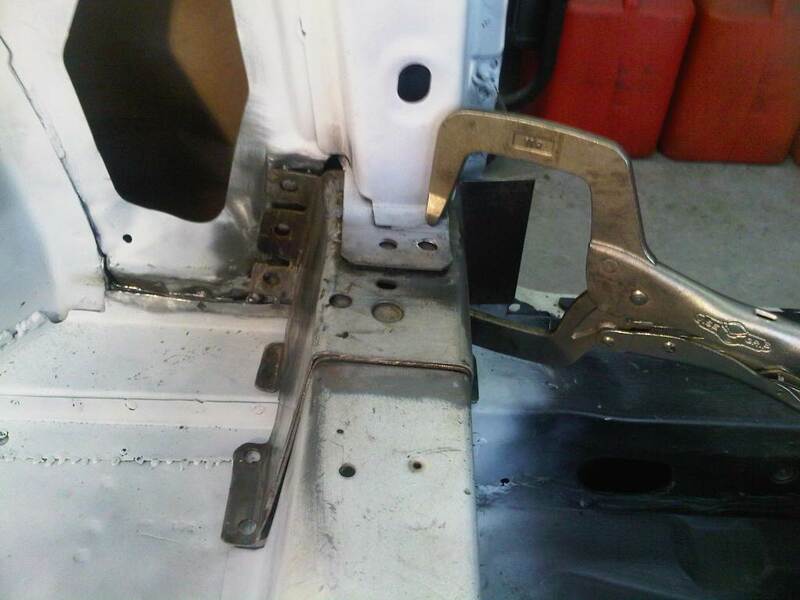 Part of the crossmember was actually missing and I had to fabricate that part. 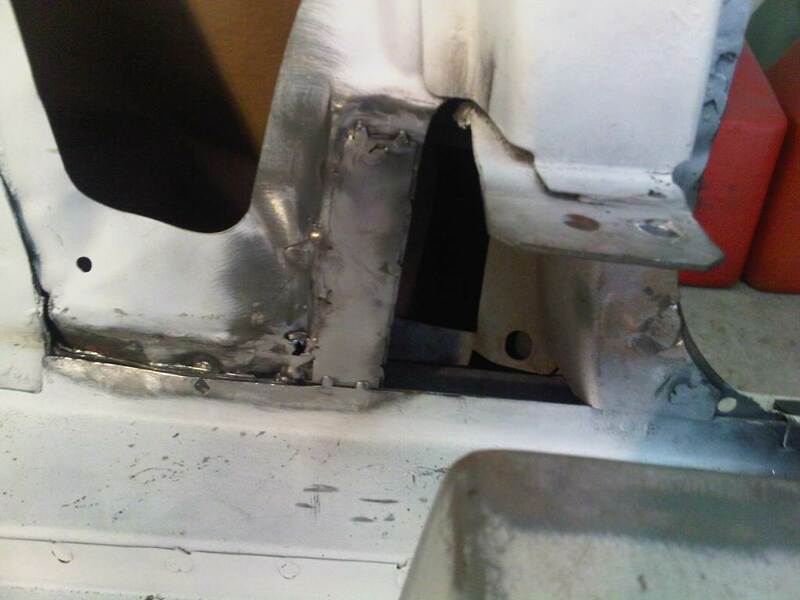 It took multiple test fits before the final welding took place. 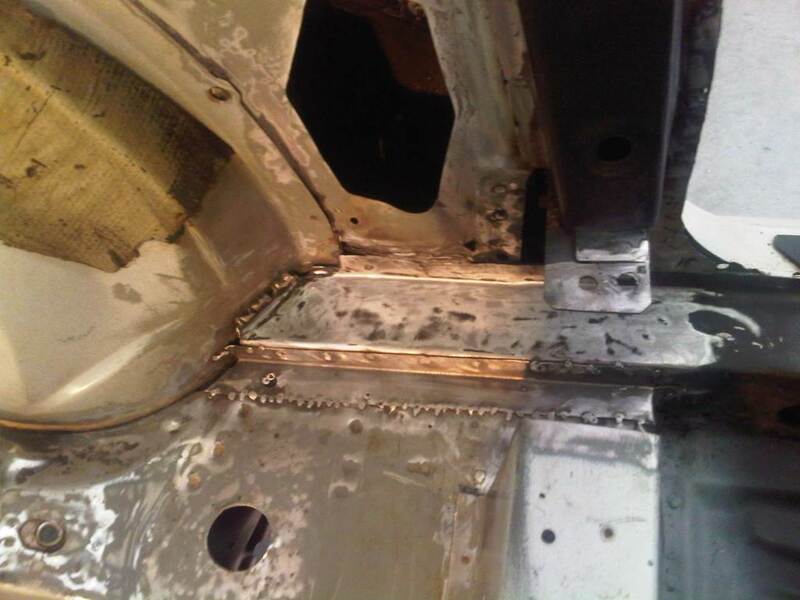 I also had to weld in fresh metal where the crossmember met the B-pillar. 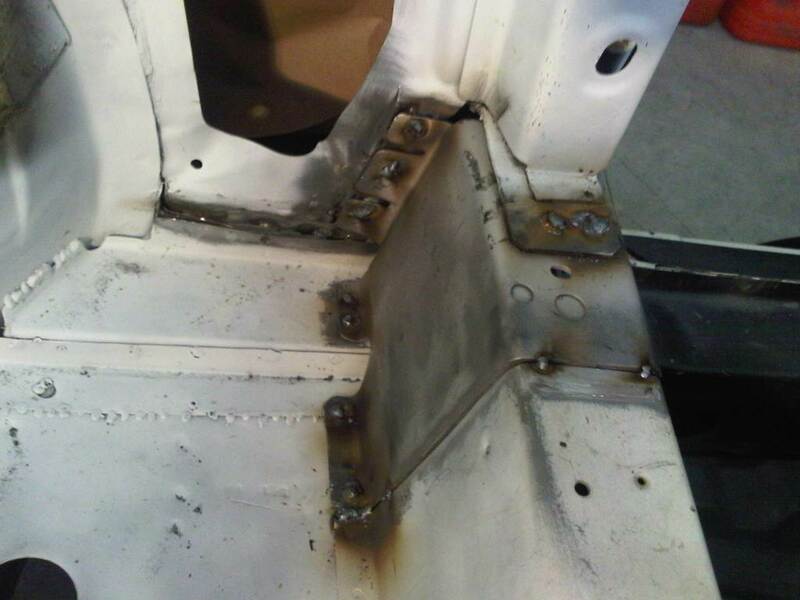 With the fabrication of the crossmember complete, I was able to weld it back into place. 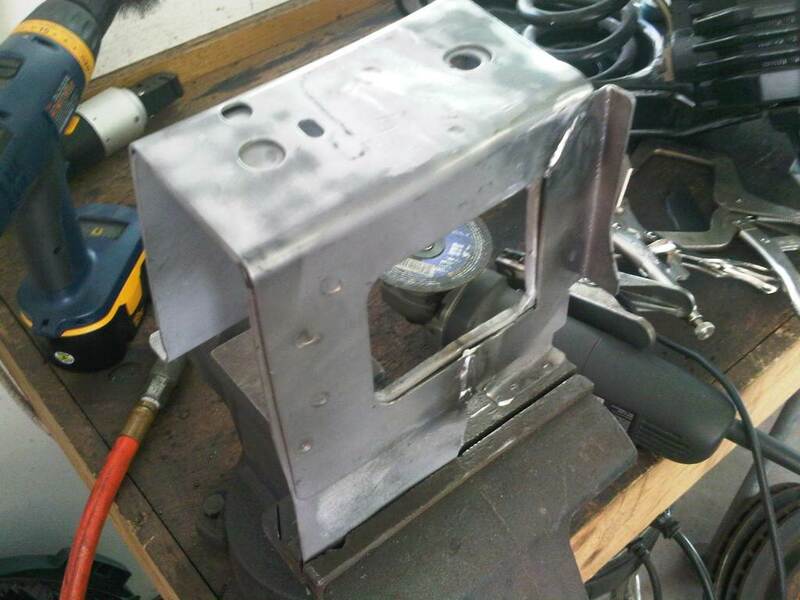 I tacked it in place first, then did the plug welds and the seam welds. 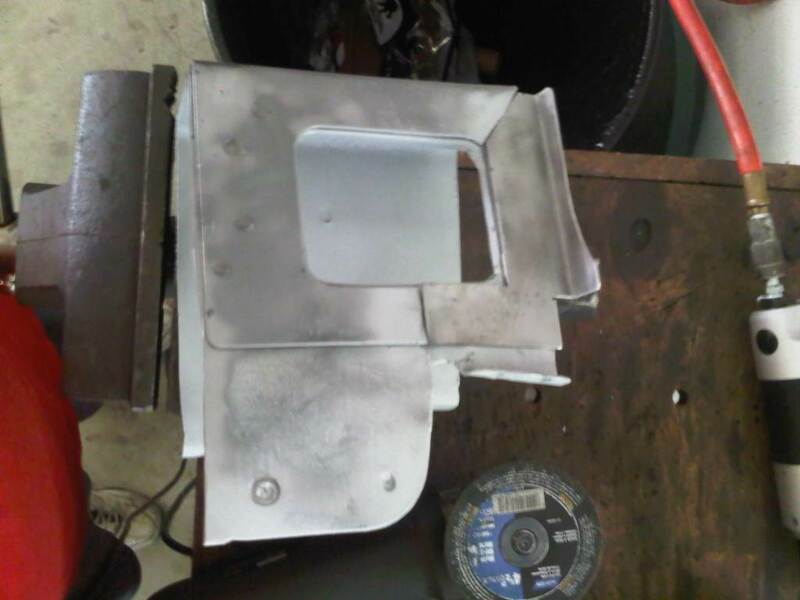 I ground down the welds on the back and front and left the seam weld on the top. 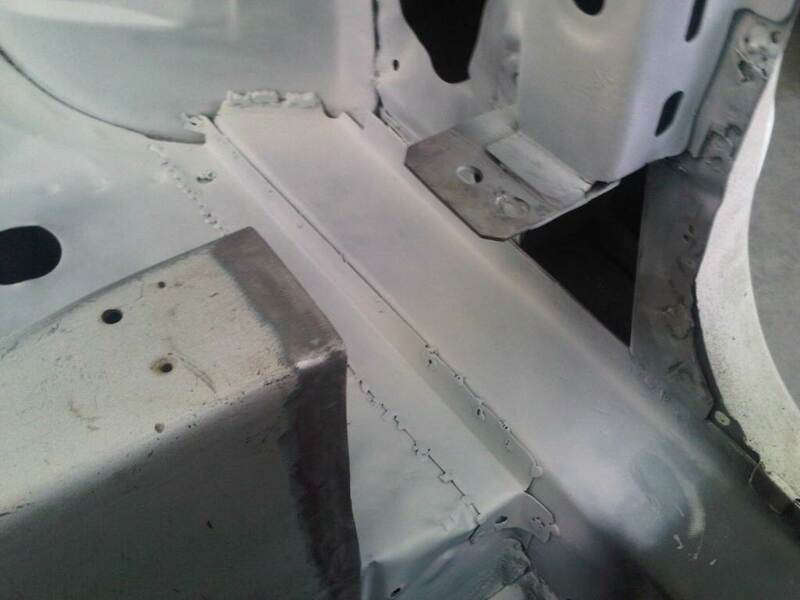 The area under the crossmember was finished with 3M weld-thru primer. 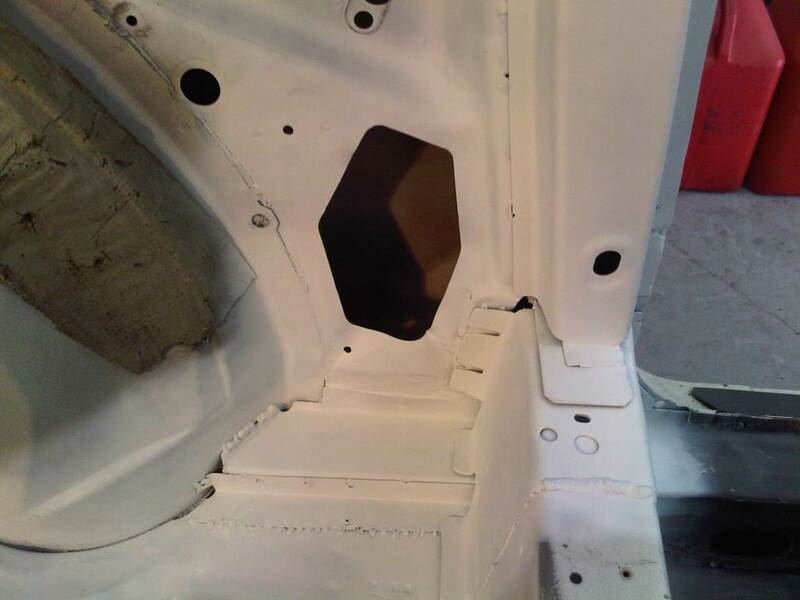 Now I was able to finish the area behind the crossmember and above the rocker. It looks much better. 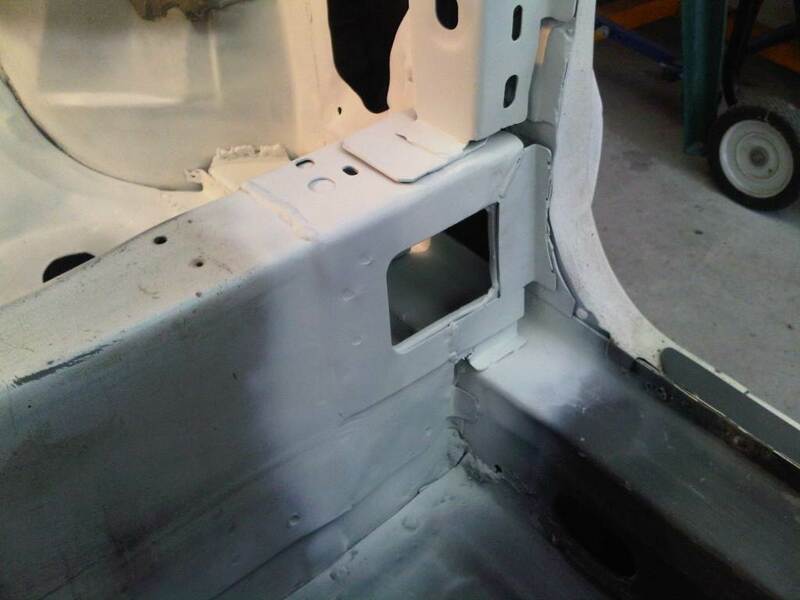 I also finished welding the holes on the B-pillar before spraying the primer. 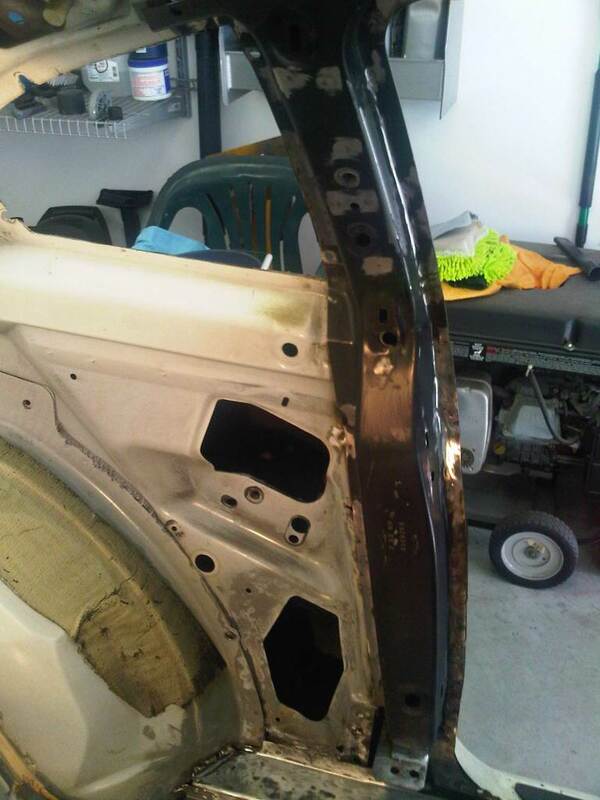 Hurray, no rust-through! 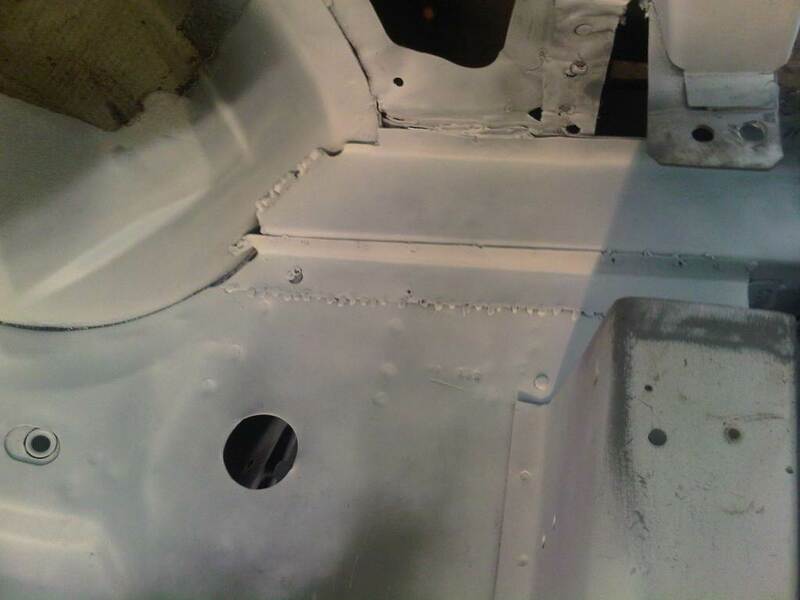 Just some surface rust to remove then on to primer.